Summer is filling up. Only one full week remaining in July. Shorter reservations welcome as well. Rates are inclusive: professional cleaning and taxes included. Guestsgarden is a spacious one room cottage on a private 7 acre estate with swimming pond, lily pond, streams, gardens and views. Only the owner shares this peaceful natural retreat, minutes from everything exciting in the Berkshires and Columbia County. Originally built by artist caretakers to a Manhattan horticulturist, the cottage has it's own driveway and is a spacious, 550 sq. feet with a large bedroom/sitting room, separate full kitchen and a sky-lit bathroom. There is a queen size bed, reading and dining areas, Cable TV, , a CD player, WiFi, air conditioning and heater. It is comfortable, has charm and is well equipped. From a picture window where a table is placed, you can look over the gardens to the one acre pond, a glorious view all year round. In summer you can hear the stream trickling from the small front deck. Or step out the back to a private shade garden with cushioned lounges for reading, a propane grill, table and chairs for outdoor dining. A gazebo cantilevered over the water is for your use alone. Perfect for reading, relaxing, a glass of wine before dinner. The cottage is heaven sent for an individual or couple who want to relax in a natural retreat yet still have access to all this popular tourist area offers. Tanglewood and Kripalu. Less than half and hour to the towns of Great Barrington, Stockbridge and Lenox, Mass., as well as Hudson, Hillsdale and Chatham, NY. There are ski slopes nearby, golf and tennis, hiking, biking, fine restaurants, theaters, films, concerts. Museums, historic homes, antiques, festivals, farmers' markets, wineries, distilleries, celebrity sightings so much more. OCCUPANCY: two adults unless special arrangements are made in advance for a guest. inclusive. There are no extra charges or fees that go to me. CANCELLATION POLICY: A full refund of the deposit minus a cancellation fee* will be granted if cancellation is made 31 or more days before the date of scheduled arrival. A 50% refund of the deposit will be granted if cancellation is made 15 to 30 days prior to arrival. There are no refunds for no shows or abbreviated stays. An exception will be made in winter to this policy with cancellations that are due to forcasted storms. A full refund minus fee of $75 will be granted for cancellation prior to entry but none for abbreviated stays. Please keep abreast of weather reports, as will I .
that the property was once woods and although beautiful and almost always quiet, neither the cottage not the main house is immune to bad weather, critters, power outages and other such country things. We certainly do our best to prepare for contingencies that are beyond our control. reviewed our internet connection very favorably. Privacy has been reviewed positively as well. During summer weekdays, there may occasionally be mowing in the afternoon. Or gardening. You will be informed if someone needs to come near the cottage. So keep the window shade up, relax, and enjoy the spectacular view . CHECK IN:2PM . Check out 11AM. Check out times may be flexible. Inquire. Smoking is not permitted. Sorry no children or pets. Infants welcome. Am an expat of Manhattan but grew up outside of Boston. For years my family rented a tiny cottage in the area so as to escape the city in the summer. We began loving it more and more and making our weekends longer and longer. When we made the leap to move up full time, we chose this location because it is on border of Berkshire and Columbia Counties, near all the bright lights, yet very peaceful and tranquil. We were hoping to find a property with one distinguishing feature; we never expected to find one with so many bells and whistles. Swimming , canoeing, walking around the pond, enjoying the gardens, lazing about the property ,watching the hummingbirds skim past the flowers. Reading under a 100 year old tree. Listening to the trickle of the stream. Fresh air. sipping that first cup of coffee outside, exercising on the gazebo. Yoga. Meditation. Slowing down. There is a volunteer fire department at foot of street, Rte 22, and a little shed like post office across the street from that. 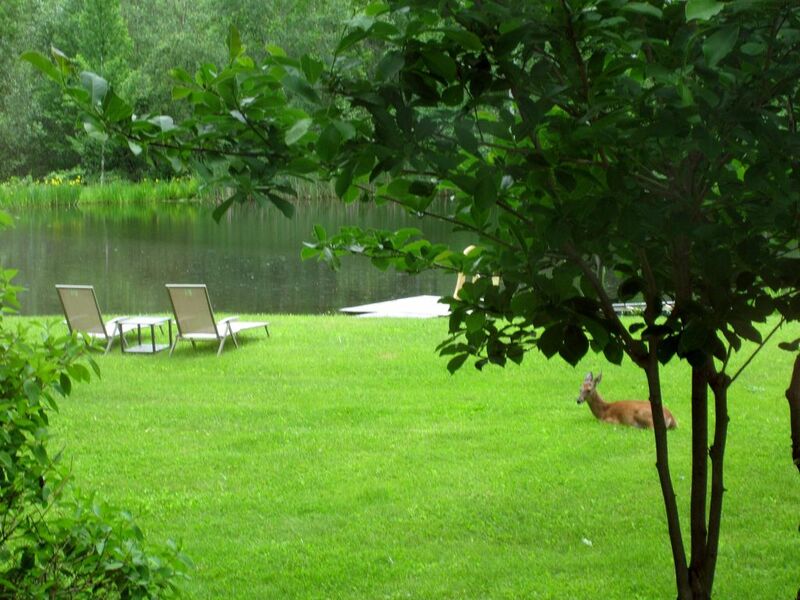 It is peaceful, bucolic and minutes away from 6 major towns. Austerlitz was once part of Mass, right on the border of the Southern Berkshires. Greater Austerlitz includes Spencertown and our tiny hamlet with firehouse, post office and Millay Colony. We recently opened up the view to the swimming pond more and even the gazebo can be seen from the picture window in the cottage. I love buying linens for the cottage and reviews have made note of quality. Garnet Hill, etc. Full galley kitchen. Appliances include microwave, toaster oven, after many years, it is pretty well stocked with whatever you need to cook and serve.If something is missing, borrow from house. Tanglewood, Jacob's Pillow,Kripalu,theater, concerts and Blue Grass Festivals, Country Fairs, Farmers' Markets, Antiques, Fine Dining, Historic Homes, Botanical Gardens, six great New England Towns to visit, and new to the area, even a nightclub or two, live music and dancing. Located on the cusp of Mass/NY.